Graphics of our pages were modified to meet the current trends in web design. Hope you like it. Over a couple of days our pages were temporarily unavailable due to a scheduled upgrade of our server database. Sorry :-(. One of the pictures from our PhytoAtlas appeared on the cover of American Laboratory August issue. We are truly honored :-). Due to an enormous increase of spam, our chat is temporarily disabled. Sorry :-((. We hereby beg to inform you that a new set of microscopic postcards was just released. Ten pictures coming from our PhytoAtlas illustrate immense diversity of shapes and colours hidden in a droplet of water and open the door into the unknown micro worlds. The whole set called "Biodiversity in aquatic micro worlds: algae and cyanobacteria" was supported by ALTER-Net and the Czech representation of Olympus. ALTER-Net - A Long-Term Biodiversity, Ecosystem and Awareness Research Network is one of several Networks of Excellence established to achieve lasting integration of research capacity. ALTER-Net is addressing biodiversity research in terrestrial and freshwater ecosystems. The result will be the establishment of a lasting infrastructure for integrated ecosystem research, combining ecological and socio-economic approaches, and with greater emphasis on communication with relevant audiences. Our article on cyanobacterial bloom composition and microcystin concentration in eighteen eutrophic Czech reservoirs was recently published. PDF file can be downloaded here. During March the number of visitors exceeded one thousand. Therefore March has been the most successful month in a history of our web pages. About 60 new microscopic images were put into PhytoAtlas section. 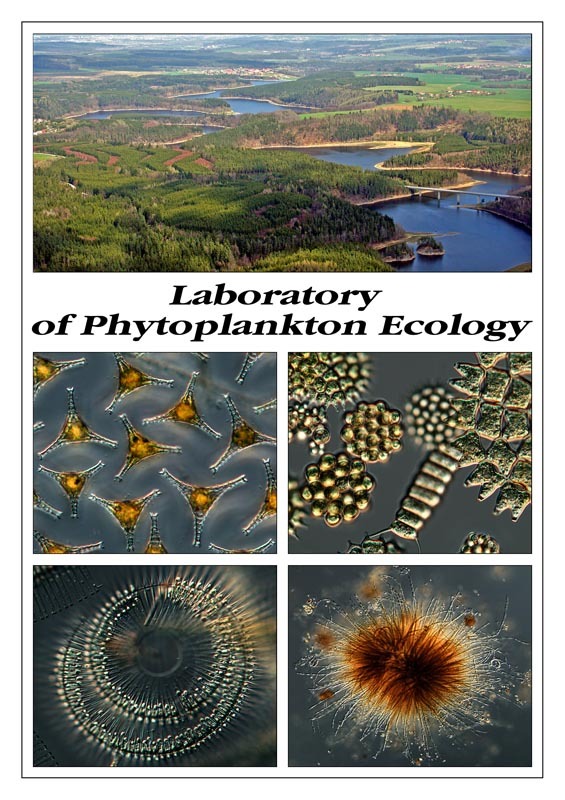 Since now we will add new pictures regardless the taxa are planktonic or not, however, phytoplankton still have the priority for us :-)). It is a pleasure to inform you that one of the microphotographs in our PhytoAtlas received an Honorable Mention in the 2005 Olympus BioScapes International Digital Imaging Competition. We hereby beg to inform you that "The 5th International Conference on RESERVOIR LIMNOLOGY AND WATER QUALITY" will be held in Brno (August 27 - September 2, 2006). In framework of the conference, the satellite workshop "Cyanobacterial water blooms: effects, consequences and management" takes place either. Everybody is welcome. The details about the conference can be found on the official webpage www.reslim2006.cz. Announcement can be downloaded here. 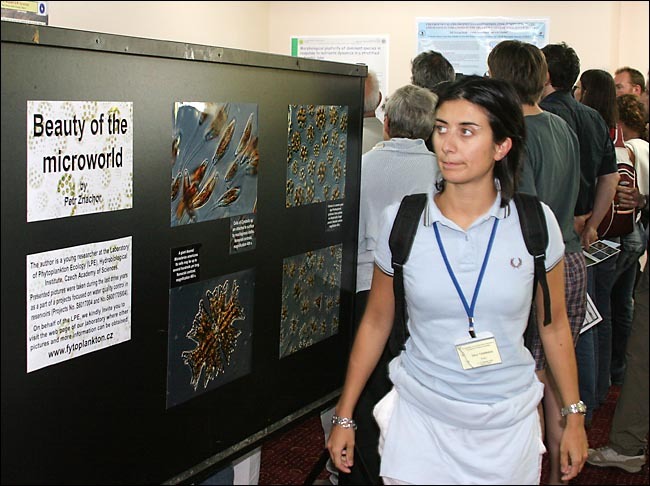 On the occasion of the 14th IAP meeting, the exhibition of microphotographs "Beauty of the microworld" by Petr Znachor took place in Sapanca (Turkey). Several photographs from the vernissage are here and here. An large article about cyanobacterial blooms from Petr Znachor was published in July issue of Scientific American (Czech edition only). The article is followed by the other one on massive occurence of green alga Pleodorina indica in the River Malše in summer 2003. Outstanding graphic design of both articles combines text boxes with attractive microscopic pictures commonly used as background of whole pages. Articles can be found here and here. Our paper on the occurence of a tropical scum forming alga in a river flowing through our city has been published in Hydrobiologia. Here is a pdf file you can download. New photographic postcard of our laboratory is available. Get more information on my e-mail. Photographic exhibition ”Water blooms in Czech reservoirs", Observatory and Planetarium, České Budějovice, March-June 2005. A small brochure on cyanobacterial bloom in Czech reservoirs was released. The main purpose of this material is to provide an information about what we do for public. On November 29th, a vernisage of Petr Znachor`s exhibition of microphotographs took place in Academia Bookstore, Venczeslav Square 34, Prague. 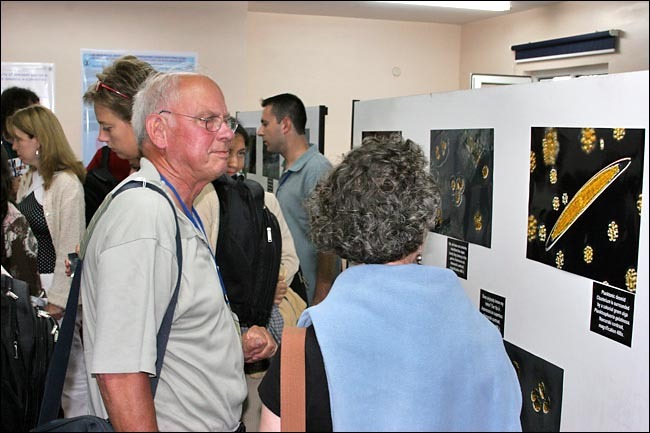 The exhibition "Algae, cyanobacteria and water blooms in Czech Reservoirs" proceeds until the end of December. 2th December 2004 - GETTING STARTED.